Quarterbacks were on display during the New York Giants and New England Patriots preseason finale, and we’re not talking Tom Brady or Eli Manning. Patriots QB Jacoby Brissett threw four touchdowns and 341 yards while a trio of Giants quarterbacks combined to finish with two touchdowns and 342 yards through the air. However, it was a pair of field goals in the waning moments that gave the Giants a wild, 40-38 back and forth victory over the Patriots. New England closed a 16 point gap in the fourth quarter, but fell on a Aldrick Rosas field goal as time expired, and with that, we give you our PFF exclusive takeaways from the contest for each team. 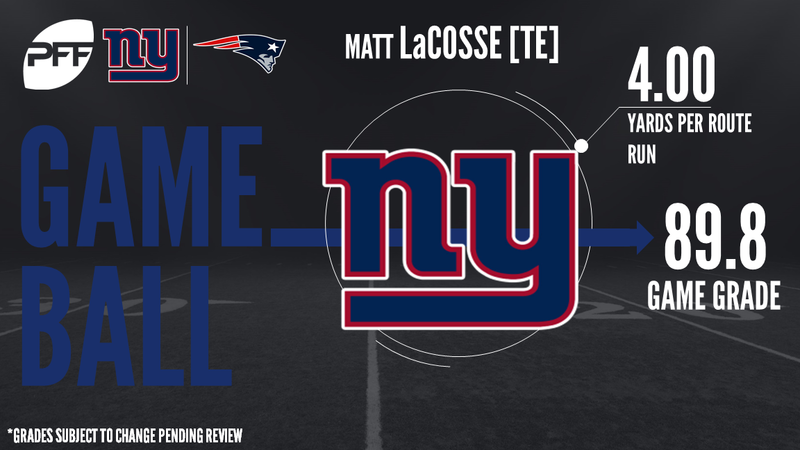 The go-to receiver for Giants’ quarterbacks, LaCosse caught all five of his targets for 60 yards and two touchdowns. In addition to the two scores, he caught the two passes that set up the game-winning field goal, separating nicely on back-to-back “out” routes. Smith finished strong after a subpar preseason, completing all seven of his passes in the 1-9-yard range (62 yards) while also completing all four of his passes under pessure. He made good decisions and found open receivers, both keys for Smith if he has to see any action this season as the Giants’ backup. While he didn’t officially register a pressure, DE Wynn made his presence felt with a pick-6 as he shed a cut block, got into a passing lane and picked off QB Jacoby Brissett with the best play of the game. Wynn complemented that play with his usual solid work in the run game (77.7 run defense grade) as he looks to contribute in a rotational role once again this season. Scott nearly ended the game with an interception, but had to settle for the pass breakup instead and he added two stops on the night, one in the run game and one against the pass. The 2015 undrafted free agent has yet to see the field for a regular season snap and he’ll have a difficult time making the final roster despite a solid finish to the preseason. It was an eventful night for Brissett who went the distance and finished 28-for-39 for 342 yards and four touchdowns to go with a rushing touchdown. He was in command for the majority of the game, moving the chains and completing 6-of-9 passes while pressured. His end zone fade to WR Devin Lucien was a beauty, and while there were a lot of positives to take away from the game for Brissett, he did get careless down the stretch and nearly threw the game away with two poor decisions that ended up as dropped interceptions. Still, there was more good than bad for Brissett who took advantage of the playing time and blew up preseason Week 4 DFS leagues. Brissett’s favorite target, Lucien caught five of his six targets for 96 yards including the touchdown. He was able to get behind the defense for a 45-yarder and he did a fine job of adjusting to off-target throws throughout the night. Lucien may not have a roster spot in New England, but he capped the preseason with the best showing of his young career. Travis was all over the field, kicking things off with an impressive strip and recovery in the first quarter. He led New England with seven solo tackles while doing strong work in the run game whether taking on blocks or cleaning up plays at the line of scrimmage. The highlight of the game for Moore was likely on special teams where he split a double team and made a beautiful tackle as a gunner, but he had his moments in coverage as well where he gave up only three completions on seven targets including one pass breakup. With a deep potential group of corners in New England, his special teams play may have been most important, but it didn’t hurt to have a strong game at corner on his game-high 75 snaps.